If the Brawlhalla Winter Championships were the springboard for the Brawlhalla Championship Circuit, then the Spring Championships find the circuit in full swing. Over four thousand players took part in the Circuit’s inaugural event, and with as many already signed up for the Spring version, this Seasonal Event is shaping up to be one for the ages. The fallout of the Winter Championships are still clearly in play, with Maltimum’s victory there starting a strong streak of results, and Dobrein’s less than stellar performance repeated since. It was also during the Winter Championships that Diakou was so vocally dissatisfied with his inability to beat Maltimum, and has been vocal since on his unhappiness at the way he is performing this year. In doubles, it’s more of the same. Maltimum and TB remain at the top of the leaderboards, but it’s the lack of the likes of Addymestic and Cake which is truly surprising. The duo had a fiery start to their association at the Winter Championships, but since then, their flame has been subdued. There’s little doubt that things have changed since the Winter Championships. Big changes have been made to balance and weaponry, including plenty of time for players to learn and push the boundaries of Scythe. As it stands, big questions will be answered at the Spring Championships. What does it take to beat Maltimum? 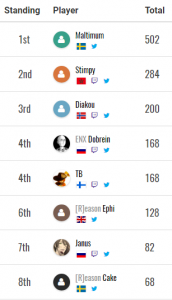 The current Top 8 for Brawlhalla EU 1v1. That’s what the EU is wondering, as Maltimum’s unwavering excellence has become more intimidating with each exceptional run that he makes. It all started at the Winter Championships, where Maltimum defeated top seeds Dobrein and Diakou on his way to a surprising victory. It has stopped being surprising; Maltimum has defeated all comers in proving that he is absolutely on the same level as Dobrein, once the undisputed Champion of the EU region, and Diakou, whose excellent performance at BCX underlined his abilities. Now, with a third place finish at CEO Dreamland – outpacing both of his EU rivals – he is arguably the EU’s top player. A victory at the Spring Championships would make that status inarguable, and you can be sure Maltimum has his eyes set on the top prize. In fact, a win at the Spring Championships would leave Maltimum almost 500 points clear of Stimpy in second place. One stumbling block for Maltimum may well be Reason’s Addymestic, who registered a swift 3-0 victory over Maltimum in Grand Finals of Brawl League’s Spring Fling. Addymestic couldn’t make it to CEO Dreamland, as he and the rest of the Reason crew ran into travel problems. Addymestic went into the Spring Fling with a point to prove, and proved it in style. During that event he also took out fellow Reason crewmate Ephi, and beat one of the EU’s strongest players: Diakou. Will Diakou and Dobrein Make a Comeback? Dobrein (left) and Diakou (right) play 2v2 together at CEO Dreamland. For his part, Diakou has been open about his struggles this year. Despite some strong performances, Diakou expects nothing but the best, and his inability to take that last step and claim some major tournaments has haunted him throughout the Circuit. Despite his high place on the leaderboard, Diakou has yet to claim a top spot in any tournament this year. Having publicly acknowledged some problems with his mentality after his relatively poor performance at CEO Dreamland, Diakou will be entering the Spring Championships with a whole new mindset. If he can overcome the mentality issues, he will no doubt be a threat, as Diakou at his best can take down anyone in the world. On the other hand, losses against Addymestic and Stimpy might suggest that he’s not quite there yet. His doubles partner, Dobrein, having finally managed to obtain a visa to travel to the USA, made his LAN debut at CEO Dreamland. It says a lot about the level of his play that a Top 8 finish was considered a disappointment, but a disappointment it was. For a large part of his career Dobrein has been considered one of the very strongest players around, but he has had some recent struggles that he will be desperate to put behind him. A 17th place finish at the Spring Fling is one of Dobrein’s weakest finishes ever, and speak volumes as to the problems he has been having in recent times. If he can find the Dobrein of old, the Spring Championships could herald the glorious return of the unbeatable Dobrein of old. If not, however, his struggles may well continue at one of the most stacked events of the season. Will Things Be Different in 2v2? In doubles, Dobrein & Diakou remain within striking difference of the top spot. Only a few hundred points separate the duo from Maltimum & TB in first place. As two of the EU’s strongest singles players despite their recent troubles, Dobrein & Diakou have been a consistently impressive pair. And they have proven their pedigree recently. At CEO Dreamland they defeated the EU’s leading pair Maltimum & TB. In the end it took Dreamland’s two most impressive teams to knock them out of the tournament, and on the way they added the names of noeL & Blood Diamond to their list of conquests, and just missed out on defeating Crockie & Doppey to boot. Another strong threat in the 2v2 competition is Addymestic & Cake, who will come to the Spring Championships with a point to prove after missing out on the chance to compete at CEO Dreamland. Still a relatively new duo, they haven’t yet had the runaway success of the likes of LDZ & Boomie. They’ve still registered victory over the likes of Dobrein & Diakou, Ephi & Lanz and Zeloxory & Cedero – featuring Cake’s one time doubles partner. The duo have shown off a striking ability to convert off a stray hit, and Addymestic has an incredible knack for sealing stocks insanely early. Their explosive style could prove detrimental in bracket, or it could well spur them to the same heights that they achieved at the Winter Championships – where only Maltimum & TB managed to beat them. What Surprises Might Lay In Wait? With so many players in the race, there are almost certainly some surprises in store for us in both the 1v1 and 2v2 competitions. You can’t prepare for everyone, and seemingly every event brings another strong player out of the woodwork. One relative unknown, Kal, caused a stir in the Brawl League Spring Fling by finishing in fifth place. With wins over Stimpy and q4r before losing to Addymestic, Kal proved his Val is the real deal. Although Stimpy got the win in the runback, Kal made more than enough of a mark. He could do even more than that in the Spring Championships. TB, Maltimum’s doubles partner, will be hoping to make his own mark as more than just the partner of Europe’s number one. With experience battling the best in person at CEO Dreamland – despite a less than satisfactory finish – he will want to bring that experience into play at the Spring Championships. Over the last few months, TB has been consistently outplaced by his partner. This time, he’ll be hoping to turn the tables. And there are plenty of other killers already signed up for the EU event. Cedero, simpLe, dzn, q4r and Logec are all strong players, who could turn a bracket on its head. 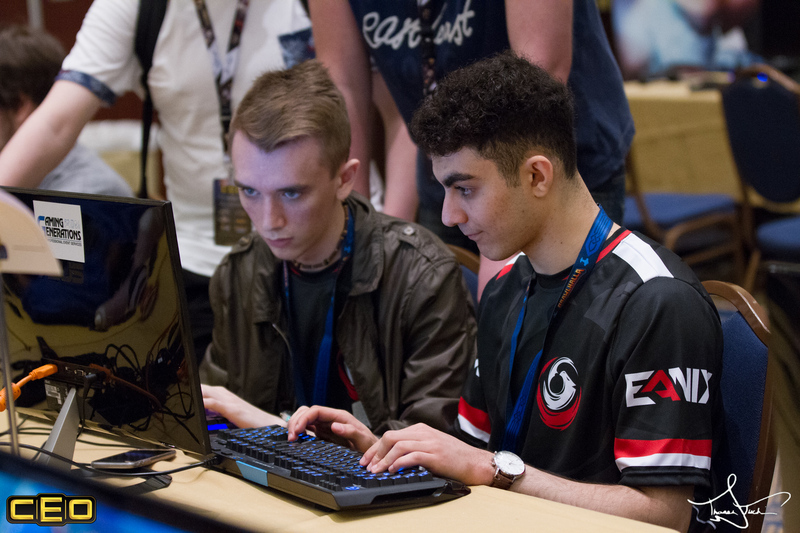 With over 2,500 players registered for the EU side of the Spring Championship, there are plenty of little known players who could surprise everyone. 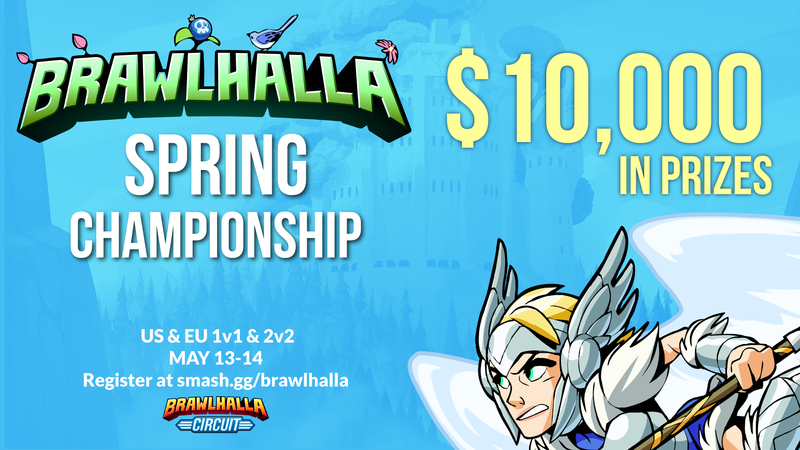 The Brawlhalla Spring Championship will take place May 13-14th. You can watch it live on twitch.tv/brawlhalla.